Screen Ireland has partnered with the Canadian Embassy Dublin, Creative BC and CMPA (Vancouver) to bring a delegation of Irish producers to the Banff World Media Festival (9th – 12th June 2019) and Vancouver, BC (13th & 14th June 2019) with a particular emphasis on TV Drama. 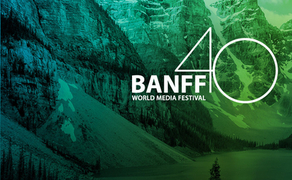 The Banff World Media Festival takes place in Banff, Alberta, Canada from 9-12 June 2019 and will see Screen Ireland provide support for up to 8 Irish production companies to participate at this networking event. Screen Ireland will cover the cost of accreditation to the festival in Banff and provide a subsidy to alleviate the cost of travel and accommodation for the trip. This offer is available to one producer applicant per company, and we can sponsor a maximum of eight companies. The 2019 program and speaker list will be announced soon and updates can be found here. The eight producers will then travel to Vancouver, BC to attend B2B meetings and networking events. The trade mission will provide producers the opportunity to explore co-production possibilities with Canadian producers through events and meetings organised in collaboration with Creative BC and CMPA. As places are strictly limited, in applying you are engaging in a competitive process. Screen Ireland will assess applications with regard to criteria 1 - 3 below. The company should have active relationships with Canadian co-producers and have a track record of at least one official Irish/Canadian Co-Production. The applicant company should set out its rationale for participating in the Trade Mission and a detailed explanation of why participation in the delegation will be of benefit to your company, addressing in detail each eligibility criteria 1-3 above. Ensure you supply details of the official Irish/Canadian co-productions that you have structured in the past.